Setting up a PC to proper enter and return from low power states like standby (S1/S3), hibernate (S4) and Away Mode can be quite troublesome. Especially on Media Center PCs it's often considered black magic, even by experienced PC technicians. The MCE Standby Tool (MST) can be very helpful when it comes to the configuration of the various parameters. It will even make a number of critical settings accessible that normally are hidden. The tool has a number of active features that will help a system handle the power transitions properly. Automatic periodic reboots, closing and restarting of the media center applications and media center idleness detection are just a few examples. Although the tool is intentionally designed to work on Windows XP Media Center Edition it has proven to be very useful on non MCE versions, Windows Vista and systems running Media Portal as well. Ever whished you had a recording LED on your Home Theatre PC, just like the one on your old VCR? LEDSdriver might be what you're looking for. This little program can control the keyboard LEDs or drive LEDs connected to a generic serial (COM) port. When run on a Windows XP MCE or Vista Media Center PC LEDSdriver can be used to indicate there are programs being recorded or extenders connected. 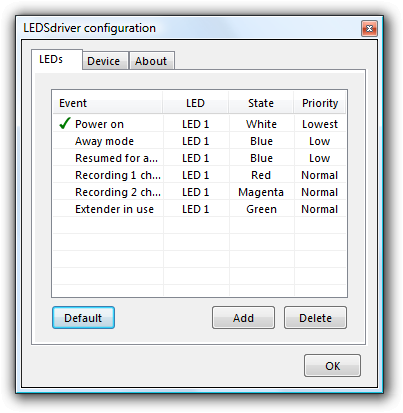 Furthermore LEDSdriver is capable to show various (low) power states of the PC on all recent Windows versions. Since version 0.9.12 the LEDs can be controlled from the command line, scripts and 3rd party applications. If you have any stand-by related questions not directly related to MST please search the internet first. Problems of this nature are very common and being discussed on numerous forums. If you have problems directly related to MST please search the internet first. 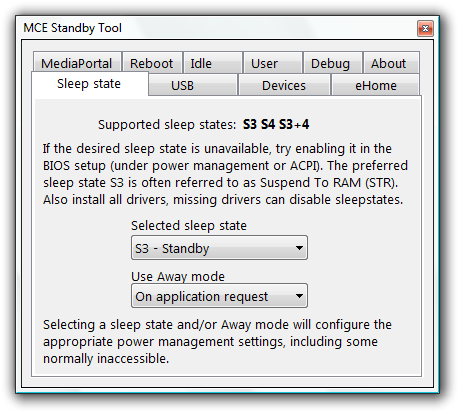 The MCE Standby Tool is mentioned on almost every major Windows HTPC forum on the web. Good sources of information on MST are: De Groene Knop (Slick Solutions' home forum), Australian Media Center Community and The Green Button.